Disney Fairytale Weddings took care of every detail for the couple and their guests. Their wedding planner told them, that from the moment they stepped into their transportation that morning, that Disney’s goal was to make them guests at their own wedding. And they were! Bryan and Mary walked down the aisle to beautiful music played by Rob on the violin. The rich blush roses that they wore and carried down the aisle were painstakingly crated by the Disney floral department, just for them. 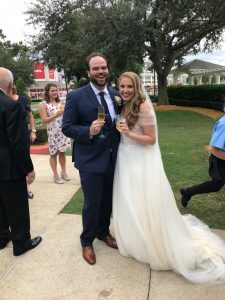 Mary and Bryan didn’t want the hassle of going to the courthouse to get their marriage license, so they used Married by Mail to obtain their Florida Marriage License for them.